It takes seven artisans to make this one special pouf-donât be fooled by less expensive knock-offs! 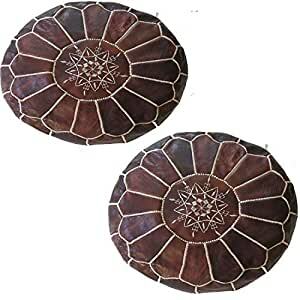 The most amazing Moroccan poufs made by our super craftsmen exclusively for KechLifestyle from the best quality of goats leather that processed naturally by hand this magic piece can really add a wonderful touch to your house it’s more than just a pouf it’s a Masterpiece that must have in every home ! Give your room a dash of style with the Marrakech Moroccan Pouf Ottoman. It is available in many beautiful colors to choose from. The round hand-made pouf is made from goatskin leather that enhances its strength and durability. It can be stuffed with filling fibers, wadding and used clothes that gives you perfect comfort and relaxation when you rest on it. The ottoman is perfect for seating and creates a nice appeal in the room. It is ideal for seating and also makes an excellent addition in your home. This Moroccan Ottoman can be wiped clean with a damp cloth. Each piece of our poufs is handcrafted to the highest standard by our own artisans in the souks of Marrakech Medina. PRODUCT FEATURES 14 inches(Height) x 20 inches(Diameter) â // 35cm(Height) x 50cm(Diameter) â. Genuine Real Leather. 100% Handmade. Hand-stitching. No chemical substance (This leather doesn’t smell bad due to vegetable tanning process) Metal zipper on the downside. Lovely Round shape. Multi usage Seating,Footrest,Ottoman,Coffee table … Easy Cleaning with a slightly wet cloth. Easy stuffing: can be filled with a variety of different materials depending on what you have available and the kind of finish you wish to achieve, the best is polystyrene balls (60L per pouf) , can use also Old clothes/blankets.. ect.